With v2.0 I planned to make several small tweaks to the game tiles. This included changing out the town/castle shapes to resemble those from the other games and smoothing out water and force fields to look more fluid. After making the changes, I wondered if some people might be happier with the traditional graphics. So why not give them the choice? This is the final new feature coming in v2.0: themes. A theme allows the game to be customized with different variations of graphic assets. 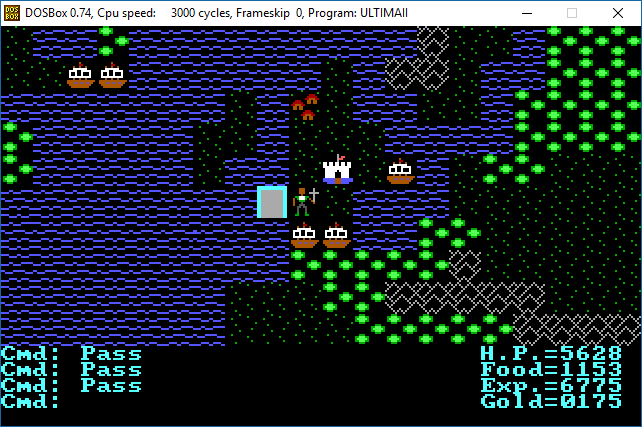 Previously, U2’s CGA tile data was embedded in UltimaII.EXE. 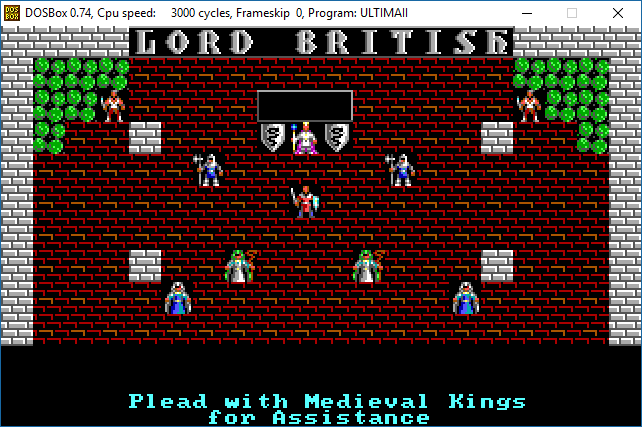 When I added EGA support, I appended all the EGA tiles to the end of UltimaII.EXE. With v2.0 I extracted all the tile data to CGATILES and EGATILES so they the config and drivers can easily detect and load them. This enables the driver to load custom alternate tilesets. The config program gives you a list of available “theme” folders by reading them from the game directory. Theme folders can include tilesets, character sets, game images or other graphic assets that a theme author can override. This is also structured so that the other upgrades can eventually follow the same pattern. 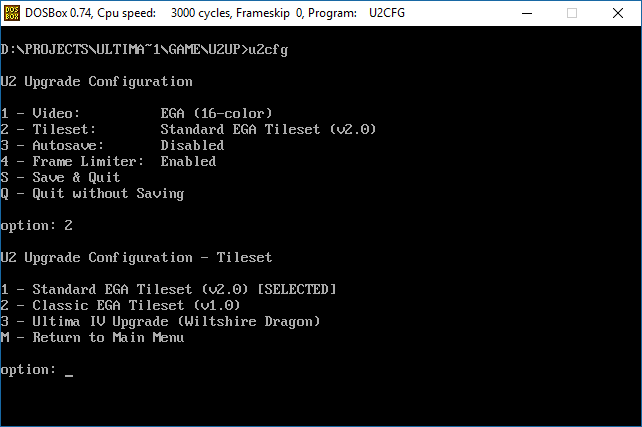 With this change, I’ve composed a new tileset option based on Wiltshire Dragon’s alternate EGA tileset for U4. Not all tiles are there, as there are some U2 tiles that do not exist in U4. This includes towers, devils, signposts and Minax herself. I imported a few missing assets from U5 such as the shield and sword. Note that I’m by no means a graphic artist! So if anyone has contributions they’d like to make then I’d gladly include it and give appropriate credit. And with that, look for the next upgrade release in the coming days. However, being able to use other tilesets opens a lot of possibilities, I think there are some japanese versions that have better tiles so, now using them is an option.